ATTENTION GLADEWATER!!! NOW FREE DELIVERY FOR GLADEWATER! We offer Moonwalk Bouncers, Bounce Houses, Combo Bounces with attached Slides, Obstacle Course, Large Dry & Wet Slides, Water Slides with pools and Water Slip & Slides double & single lane. 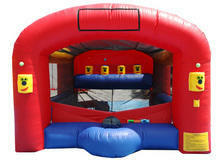 Our Interactives include: Obstacle Courses, Bungee Run, Bouncy Boxing, Joust and Sumo Suits with mat. Try our inflatable games: Twister, T-Ball (hit the floating ball), Fast Pitch with Radar gun and Hooley Ball. Add some PAZZAZZ to your next event with our Fireball Flyer Sky Dancers, Inflatable Movie Screen & Projector, Bubble Machine or our Fun Flush. Don’t forget about our Concessions: Cotton Candy, Pop-Corn, Sno-Cone and Hot Dog Machines are available. To ALL OUR CUSTOMERS: We are always compliant with all State of Texas safety regulations. Our products are inspected yearly by a licensed Texas State Inspector. Each product is issued an Inspection Certificate and is available upon request. Our service area includes Longview, Tyler, Gladewater, Gilmer, White Oak, Marshall, Hallsville, Lakeport, Diana, Ore City, Harleton, Carthage, Beckville, Big Sandy, Hawkins, Kilgore, Overton, Tatum, Lindale, Mineola, Jacksonville, Garden Valley, Hideaway, Winnsboro, Lone Star, Avinger, Holly Lake, Whitehouse, Pritchett, Chapel Hill, New London, Noonday, Pittsburg, Dangerfield, Quitman, Mt Pleasant and many other East Texas Communities. Bounce house rentals are taking the world by storm. People often don't know what to call them though: bounce house, moonwalks, jumpers, bouncers or even a kids party inflatable thing. We call them fun and we have a great selection. We also have inflatable slides, water slides and obstacle courses. We have concessions including: popcorn, sno-kone and cotton candy machines and dont forget about our Personalized CD'S and DVDS for your special child.